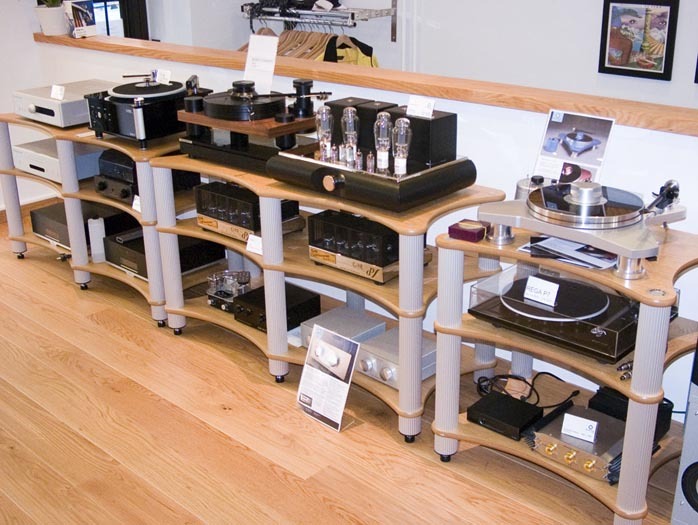 This syndicated article first appeared in the July 2009 issue of hi-end hifi magazine Stereo Mecmuasi of Turkey. You can also read this introduction on Mårten Design in its original Turkish version. We publish its English translation in a mutual syndication arrangement with publisher Hakan Cezayirli. As is customary for our own articles, the writer's signature at the end shows an e-mail address should you have questions or wish to send feedback. 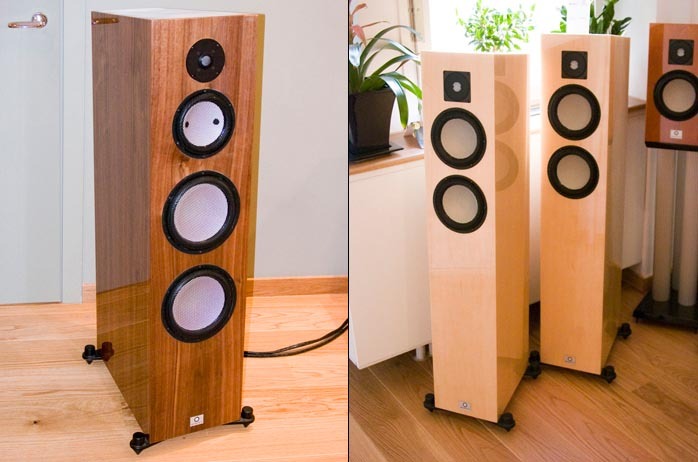 All images contained in this review are the property of Stereo Mecmuasi or Mårten Design. - Ed. It was the incredible noise that I remember most. The shouting, screaming, stamping of feet, laughter, clapping, whooping and the cries of thousands of men, women and children had congealed together into a massive ball of energy. This then rolled forwards and exploded onto the stage of musicians. It was 1986 and I was working as a sound engineer for the BBC putting out stage mics for a concert at Wembley Stadium in London. That concert was Live Aid. The energy created by millions around the world watching and the audience in the stadium was palpable. Standing on stage left I put my arm out to pass a mic to Bob Geldoff and I could actually feel the warmth and power of that energy coming from the audience. It almost burnt my arm! Somewhere I have a picture taken on the day where Elton John can be seen leaning into the photo. Well, that was over 20 years ago. I don't have the moustache anymore but I've still go Elton's phone number! Only kidding, I've lost that as well. Trying to reproduce the huge emotion of that day with a pair of loudspeakers might be impossible. What a task for any speaker designer using mechanical transducers to try and reproduce not only the music but also its beating heart and soul. Now that is a challenge! 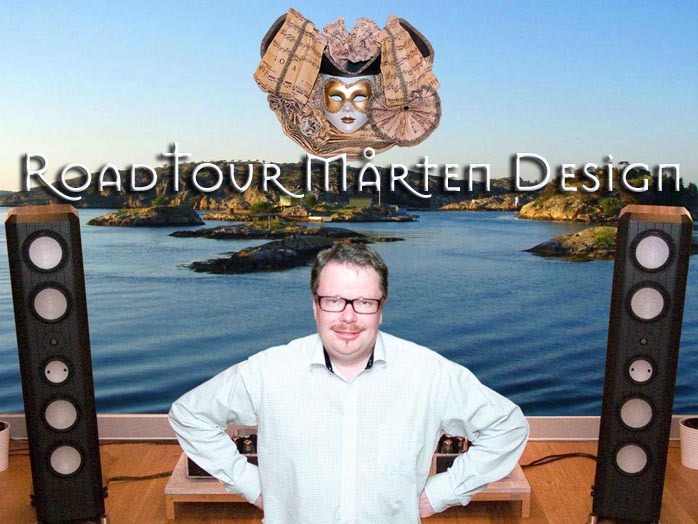 Recently I have had the opportunity of meeting such a designer who has nobly risen to the challenge - Leif Olofsson of Mårten Design Loudspeakers. Mårten are based in Sweden in the sea port of Gothenburg. Flying into the tiny airport was almost a religious experience. The storm clouds over the North Sea that had surrounded us all the way from London suddenly parted, revealing a multitude of tiny islands glistening like green jewels in a silver sea. Tiny red roofed houses dotted the landscape. What a great start to the day! 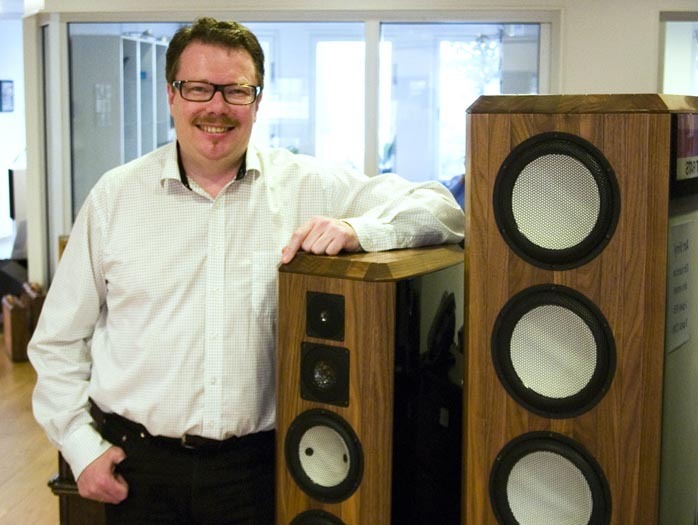 A short ride into town brought us to the headquarters of Mårten loudspeakers where I met the two brothers who had created this company - Jurgen and Leif Olofsson. Jurgen looks after the business side and Leif is the designer. After coffee it was time to look around the premises. As you enter there is a bright sunny shop, which is open for a few days a week. 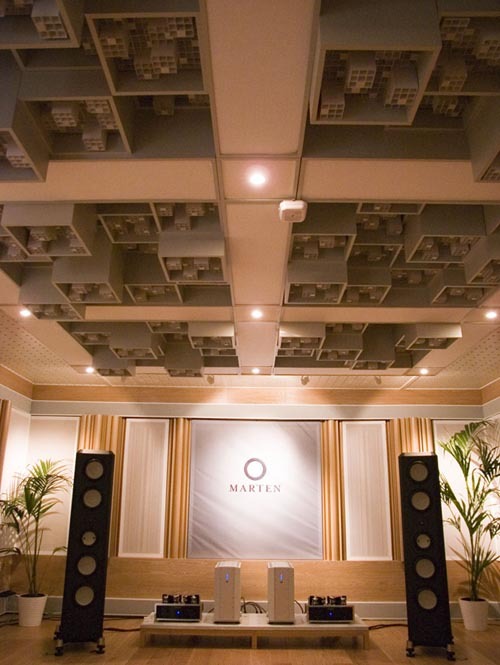 This is where the public can come and enjoy not only the range of Mårten loudspeaker but also the variety of equipment which they import. 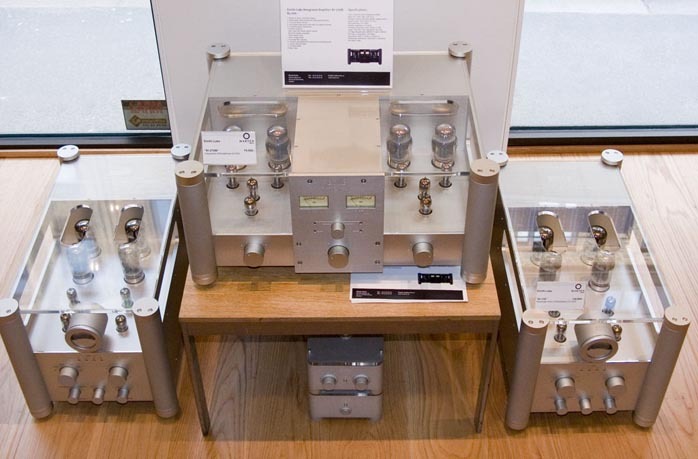 I noticed a variety of valve amps made by Einstein, Emillé Labs and Tim de Paravicini. 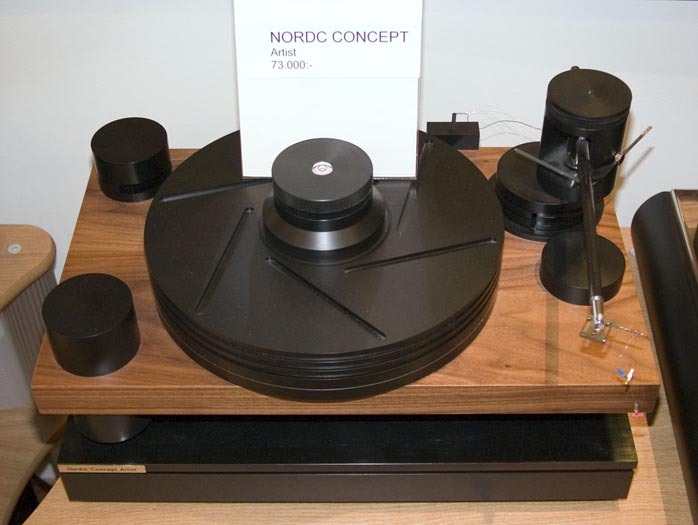 There were turntables by Nordic Concept as well as CD players and transistor amps made by local company Bladius. But it was the two demonstration rooms that were most impressive. 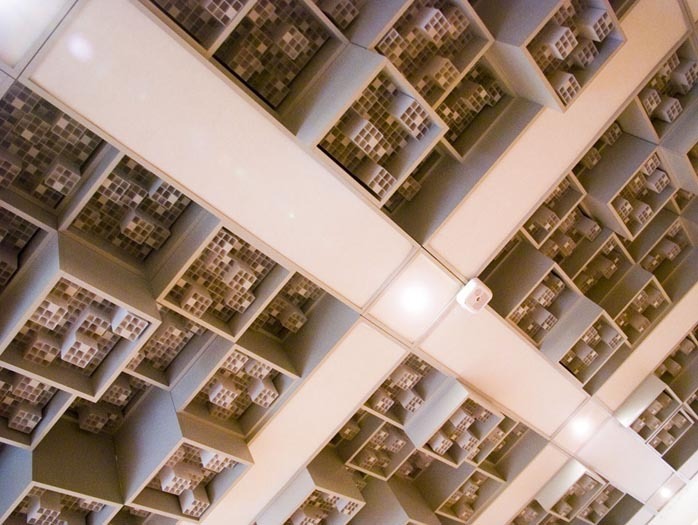 A serious amount of money has been spent on isolating the rooms from the noise of the outside world as well as controlling their acoustics. It was the second and larger demonstration room which was really something. This is where Leif carries out most of his listening tests when developing his loudspeakers. It was also where we sat so that I could quiz him about his design goals and philosophies of the almost black magic art practiced by speaker designers in their attempt to bring us into the amazing world of recorded music. Leif was one of three naughty sons born into quite a religious family. Singing in the local church choir at an early age exposed him to the live acoustic music of voices and the church organ. From the age of 12 he remembers playing with electronics and hifi. It was therefore natural for him to study electronics at college and university. This work however was not enough to satisfy Leif's ambitions. Loudspeakers were his first love. He started off as many have done before - with a simple 2-way design. Unlike most people at the time using conventional cone materials however, Leif wanted to push the boundaries. Instead of paper and plastics, he had discovered ceramics. Manufactured by Thiele & Partners aka Accuton in Germany, he ordered some units and fitted them into his design. The results to him were jaw dropping. A huge fan of jazz, Leif called the first speaker the Mingus. He soon called a journalist from the Swedish magazine Hi Fi and Music for his opinion and the result was a very positive review. 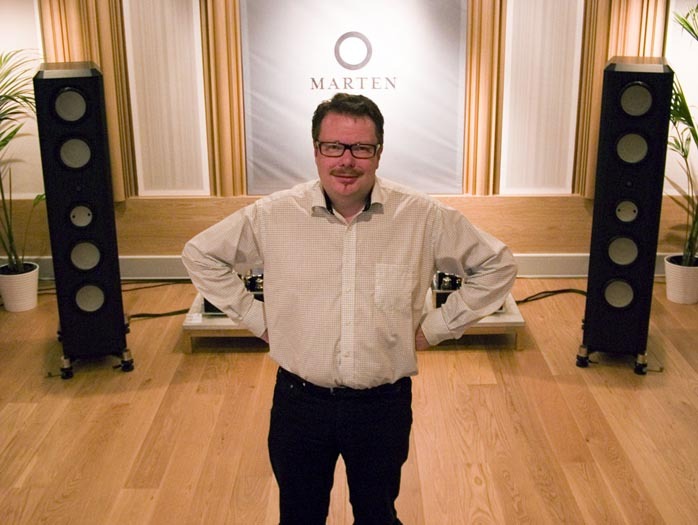 With the support of some local hifi dealers, Leif's dream of becoming a loudspeaker manufacturer had come true. It wasn't long before his brother Jurgen joined the company and Mårten was born. It was at this point that Leif caused his brother the first heart attack! The cry of "how much?" could be heard right across the city for Leif had discovered a new material for a tweeter - diamond. Ordering a pair at great expense and dropping them into one of his designs proved to be a revelation. As school kids we have all been told that diamond is the hardest material known to man. It has had many industrial applications over the years as well as appearing on the hands of millions of engaged girls. But the idea of using it as a tweeter? It seems an obvious choice now but at the time it really was at the cutting edge of technology. As usual not content, Leif decided to move forward to a statement product. He went back to the drawing board to try something different for the body of the loudspeaker. Most people use MDF for their cabinets but Leif was looking for something different. He remembered working as a kitchen designer where he was exposed to a variety of materials including glass and Corian. Actually it was a friend who had designed a sink out of carbon fibre that took Leif on a new and exciting design journey. Carbon fibre has some very interesting sound characteristics especially when combined with Kevlar. It has a very light weight and a very low sonic signature. These facts got the wheels once again turning. But hang on, how to mold it into shape? Gothenburg is a sea-faring city so Leif contacted a boat builder. With their experience of molding ship hulls out of fiberglass, could they help? After lots of experiments, another cutting-edge idea had been turned into reality. It was at this point that Leif was ready to give Jurgen his second heart attack! "Why can't you use wood like everyone else?" questioned Jurgen. Leif smiled enigmatically whilst guiding his brother's hand over the cheque book and in 2003 a new baby was born. It was christened the Coltrane. 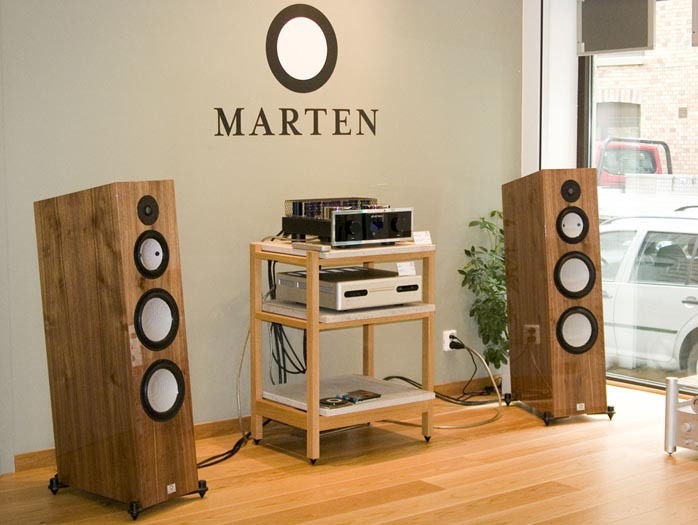 With a carbon fibre and Kevlar molded body, ceramic drive units and diamond tweeters, no one could mistake their appearance as being Mårten loudspeakers. Actually at the time I remember that loudspeaker with ceramic drivers as having some interesting characteristics but not yet sounding that good. When I heard the Coltranes at a show however, they seemed to have overcome a lot of those early problems. So come on Leif, what was the secret to your success? No secret really, reveals Leif, the answer is in the crossover. Again not content with using conventional components such as MIT caps, he started using Mundorf silver foil capacitors with huge copper foil coils. He also discovered that you must burn in the ceramic drivers at the factory to help the speaker give its best. What about the music that Leif uses to help voice the speakers? He starts by going to jazz clubs and listens to a lot of live music. He also uses vinyl and CDs and in fact one CD in particular, Feathers performed by Janette Lidström and Steve Dobrogosz on the Prophone label. The piano and human voice are two of the most difficult things to accurately reproduce. Interestingly this is not an audiophile recording but Leif uses it a lot in his designs. All of his designs start with a simple 2-way loudspeaker. When he gets this right, he then adds more units for bass and treble. 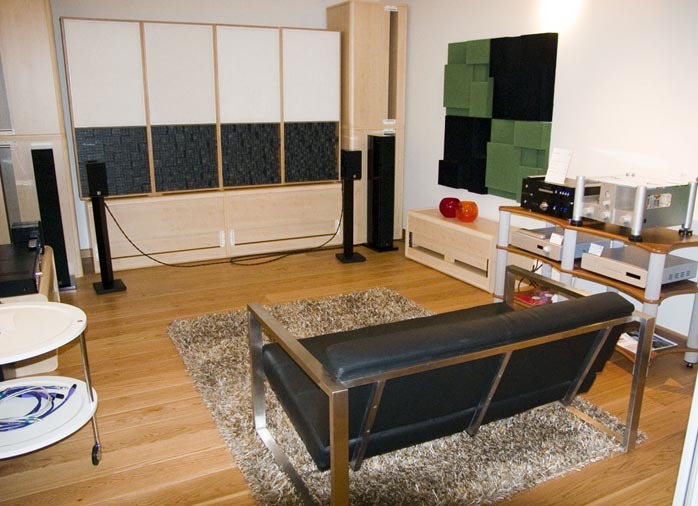 It was at this point that I spied a prototype pair of Leif's new loudspeakers which will become the Coltrane Momentos. They stand about my height from the ground and contain 6 forward firing units and 4 rear auxiliary bass radiators. A total of 10 drivers per channel! That's a lot of drivers to join together into one cohesive whole. "Would you like to listen to them?" taunted Leif. I must admit to being a bit cynical. In my experience very large loudspeakers, although sounding very impressive, can have serious imaging problems. A flute or a singer's mouth is not 3 meters wide. Well, with the first track my fears evaporated. All of the images were the correct width and height. How may times have you heard a reviewer saying I have heard this track many times in my life but on this latest flavor-of-the-month piece of equipment I have never heard such and such an instrument before. Well I am afraid it's true though it was not the actual instruments which I heard anew but the added air and space around them I had never heard before. It truly was a humbling experience to listen to tracks I am so familiar with but now find them to be presented in such a breathtaking new way. 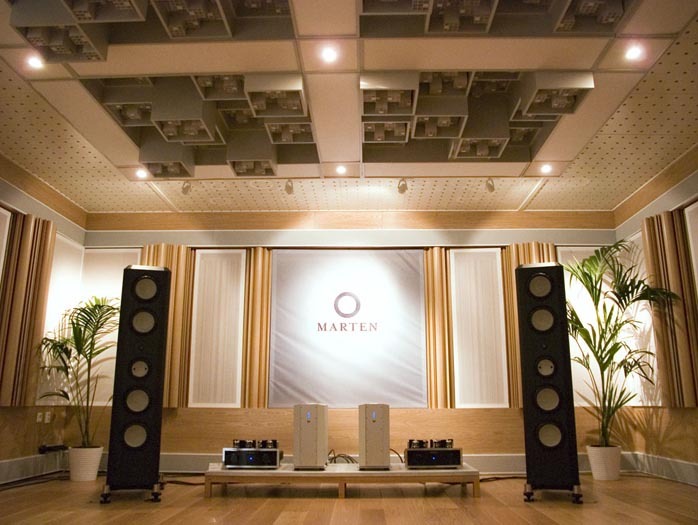 The Momentos are not even Mårten's flagship speakers. This lofty position is currently held by the Coltrane Supremes. They are a 4-box design containing an amazing transducer which in my experience no other manufacturer has as yet used. This is a midrange driver made again from diamond at really massive expense. When Leif went into Jurgen's office to order a pair of these units, his previous experience paid off as he had with him a defibrillator which would help restart Jurgen's heart! 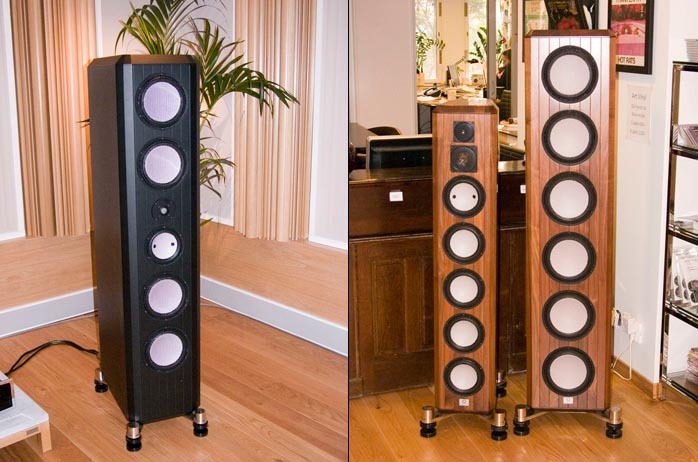 The cost of a pair of these as well as the diamond super tweeters is truly astronomical. Accuton had not actually heard those themselves because as soon as they were ready, these midranges were sent to Leif. "Do you realize that on that day, you were the first person in the world to hear music reproduced by such a device? What was that like?" Leif smiled his elfish smile and punned, "Yeah, it was really cool!" 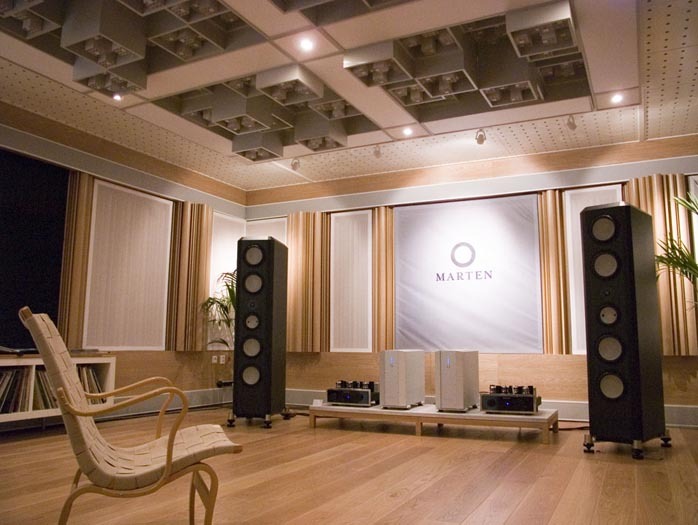 And that I think sums up the man, the company and the sounds of Mårten loudspeakers. They really are cool!